Is This Marissa Mayer's First $1 Billion Mistake at Yahoo? Hundreds of millions of users -- where are the profits? U.S. stocks opened relatively flat this morning, with the S&P 500 (SNPINDEX:^GSPC) down a fraction of a point and the narrower, price-weighted Dow Jones Industrial Average (DJINDICES:^DJI) up 0.17% at 10:10 a.m. EDT. Yahoo's (NASDAQ:YHOO) new CEO, Marissa Mayer, has just taken the biggest gamble of her tenure in announcing the acquisition of blogging platform Tumblr for $1.1 billion. Was this a smart move? 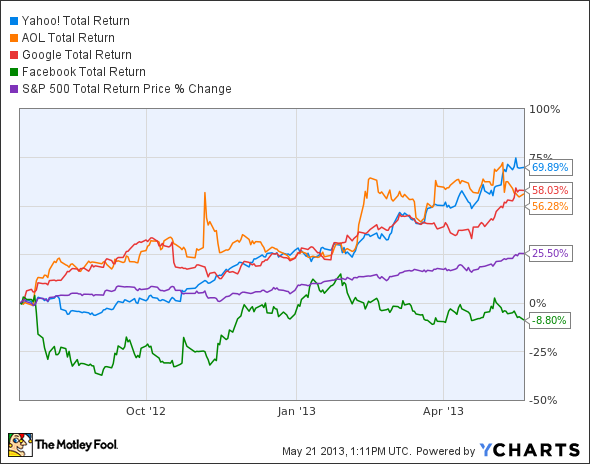 YHOO Total Return Price data by YCharts. Yahoo! has been a busy acquirer since Mayer came on board. In fact, the last acquisition prior to Tumblr was announced less than two weeks ago, on May 10 (that of Loki Studios, a small mobile-gaming company). In all, excluding Tumblr, Yahoo has now bought 10 companies on Mayer's watch. However, the Tumblr acquisition is different by virtue of its size. Usually when you do an acquisition of this scale it becomes a core part of the strategy. Our hope here is that this significantly contributes to our growth story, certainly in terms of traffic and users. The reason we are doing this is because it's an exceptional company and an exceptional team. Tumblr is one of the top 20 most visited sites in the U.S., according to online tracking service Alexa. It counts 300 million unique users, who are typically younger than those of Yahoo. However, Tumblr is not a hyper-growth story at this stage. Consider that the company was valued at $800 million in its last financing round in September 2011. Subtract any sort of acquisition premium from the $1.1 billion Yahoo is ponying up, and it becomes clear that the needle on Tumblr's valuation has barely moved over the past 18 months. Tumblr may well be an "exceptional company," but it's also believed to be a loss-making company, according to the Financial Times. Yahoo may be able to change that, but the synergies between Yahoo and Tumblr are unclear; even Mayer said the latter would remain stand-alone, without any visible Yahoo branding. I fear this may be a case of chasing the monetization of an important but highly independent and mobile user base -- the same sort of conundrum that Facebook is wrestling with.